Ever felt unsafe while running? You’re not alone! As much fun as it is to run through this city and in our Brooklyn backyard (or anywhere on the planet, really), it’s difficult to relax and enjoy your run when safety is a concern. Some alarming stats: According to a study by Road ID, 122,000 runners are taken to the hospital each year after being hit by cars. And if you’re a female runner, there are additional safety measures to consider: A 2016 Time Magazine story found that most female joggers experience some form of harassment while running, which can lead to extreme precautions like changing a favorite route, ceasing to run at night, or intentionally wearing unflattering clothing to avoid catcalls from male runners. So what are runners of all stripes to do before heading out the door to ensure their next run is safe and comfortable? 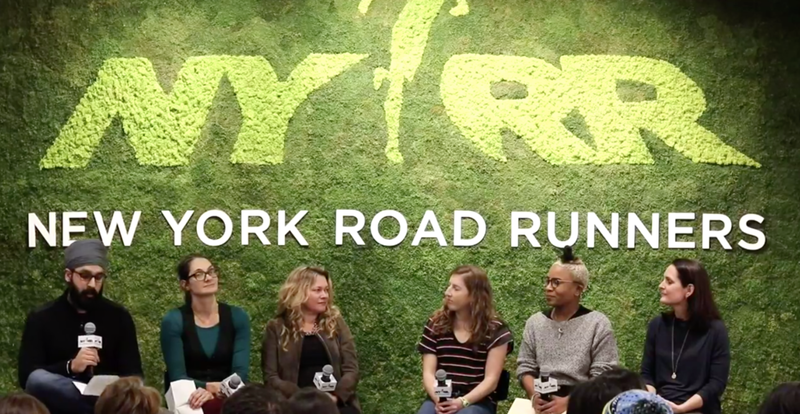 That’s what six panelists aimed to answer last Wednesday night at a panel hosted at the NYRR Run Center, as part of a weekful of events during Running Safety Awareness Week, which kicked off Wednesday, January 23, and ended Saturday, January 26. While other events included self-defense workshops and group runs, moderator Simran Jeet Singh from The Run Collective led panelists through a thoughtful discussion of topics such as race and gender-based violence, the group also left attendees with a list of helpful tips to keep in mind before heading out on their next run. There’s safety in numbers, so trailing behind a larger pack of runners (even if you want to run solo that day) means you’ll be near others who can bail you out of a potentially uncomfortable and/or threatening situation. Running without music can be tough, and it’s often the only thing that can push you through those last few miles. If you can’t give it up when you’re outside, consider a pair of headphones, such as Trekz Air by Aftershokz, which sit just outside your ear and allow street noise in. Are you an early-morning runner, afternoon jogger, or someone who prefers to head out after dark? Make sure you have a handful of family or friends who know your schedule. They’ll know if you’re missing, and you might find other runners willing to keep you company. A pair of keys, or a compact tool that’s strong enough to break glass (such as the Resqme keychain), will give you extra assurance that you’re equipped to defend yourself if attacked. While Strava is great for tracking workouts and keeping tabs on your run crew’s routes and training frequency, the Beacon safety feature will alert your contacts to your whereabouts in real time via GPS...a more modern version of that post-it note you always leave on the fridge. If you’re a male runner looking to help a female runner in trouble, be observant and follow their emotional lead. You might be tempted to immediately yell, curse at or even punch the offender: Don’t. Speak in a calm manner first to avoid escalating things into an even bigger confrontation. This app shares your location and profile with your emergency contact, the dispatch operator and nearest first responder, which can improve response times by 40 percent--which can be critical when you’re confronted alone on the run. Trust your intuition The last tip (and undoubtedly the most important): If something feels right, you know it. Same goes for when it doesn’t: If you’re running a route and suddenly get a feeling like you should GTFO, don’t ignore that gut-feeling. But don’t let it keep you indoors, either: Twenty-four percent of a survey of 800 women said they pay to run on treadmills because they don’t feel safe running outdoors. Running outdoors is often more fun, more enjoyable, and a better workout than staying in the gym...so it pays to empower yourself before you head outdoors.